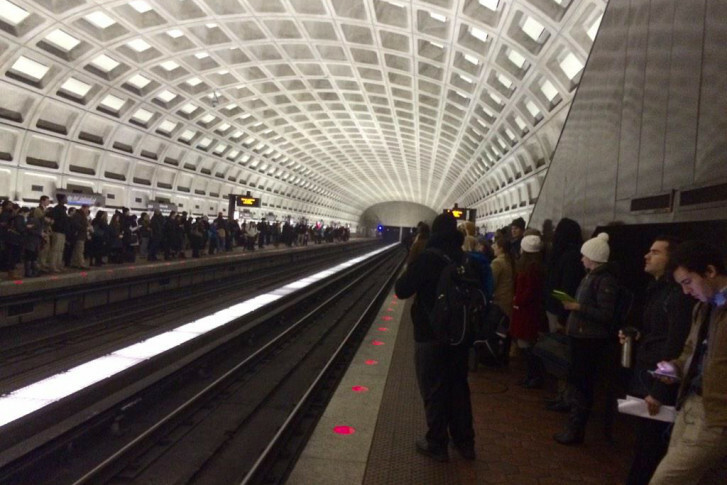 WASHINGTON – Two cracked rails on separate Metro lines led to delays, confusion and frustration during the heart of the Thursday morning commute. With the coldest temperatures of the season, rails cracked at East Falls Church and outside Prince George’s Plaza. To fix them, Metro had to single-track trains, forcing delays on the Orange, Silver, Green and Yellow lines. “We know it was a very difficult morning,” says Dan Stessel, Metro spokesman. Some riders contacted WTOP saying they were kept in the dark without adequate communication regarding why there were delays and when the next train would arrive. A few claimed to wait 20 minutes without updates. They described station managers as being uncertain about the status. While conceding the delays were cold and frustrating, Metro believes it got out the word. “I’m satisfied with the way that the disruptions were alerted via Twitter, via Metro Alert systems, via the platform screens, via the entrance kiosk screens,” says Stessel, who provided a log of alerts. Plunging temperatures have a tendency to wreak havoc on rails with few solutions. However, Metro says some of the system’s oldest cars caused additional delays on the Red Line when one of those cars disabled a train. The oldest cars are almost 40 years old, have mechanical parts that are wearing out and need to be replaced. Within weeks, a new series of rail cars will arrive to replace the most-dated cars in the network. Metro riders vented over social media about being stuck in the cold, late for work and uninformed about when the next train would arrive. A frequent refrain suggested that rail systems in colder cities like Chicago or New York even Moscow get by without such regular disruptions. “Transit systems always look like they’re running better in cities you don’t live in,” Stessel says. In Chicago, where temperatures plunged below zero Wednesday night, “L” trains were running on time this morning. But the CTA rail system is not immune from split rails and other cold-weather related maintenance problems. Keeping the “L” running on-time is a matter of practice and preparation, says CTA spokeswoman Catherine Hosinski. “We do incur cracked rails and issues as well as issues with our equipment. But because of our preparations for winter weather, we are able to mitigate any major impacts to our service,” she says. Like Metrorail, the “L” train lines operate on an electrified third rail. In a city used to bitterly cold air, Hosinski says CTA officials are well rehearsed when it comes to arctic invasions from the north. Created in 1947, the CTA operates infrastructure dating back to the 19th century. Like Metro, CTA has committed to a multi-year improvement project that includes the implementation of new 5000 series rail cars. “We’ve been announcing some aggressive plans and initiatives to modernize our infrastructure which (will help) get us through severe winter weather,” she says.